Are you one of those people who can’t remember when your favorite shows are on TV? 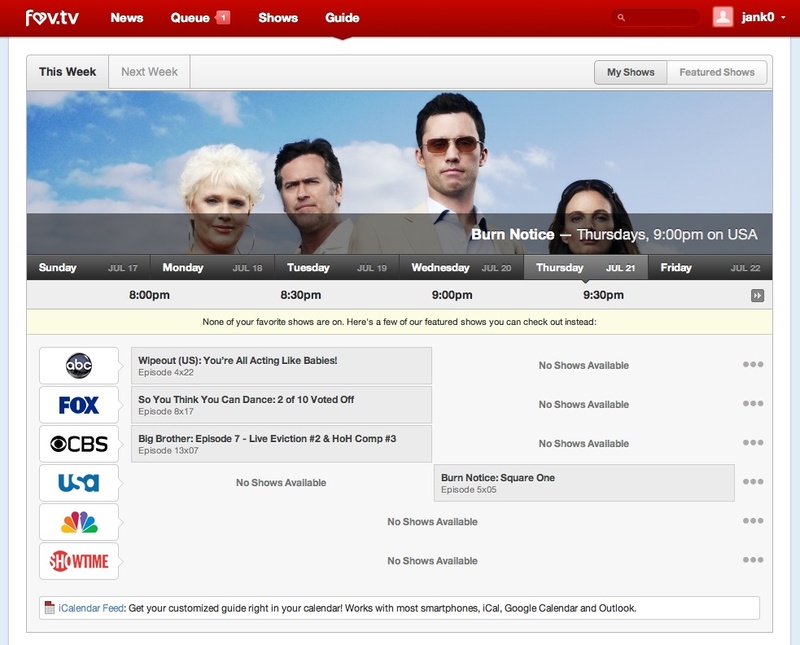 The new interactive TV guide Fav.tv, which launches its closed beta today, wants to make your life easier. 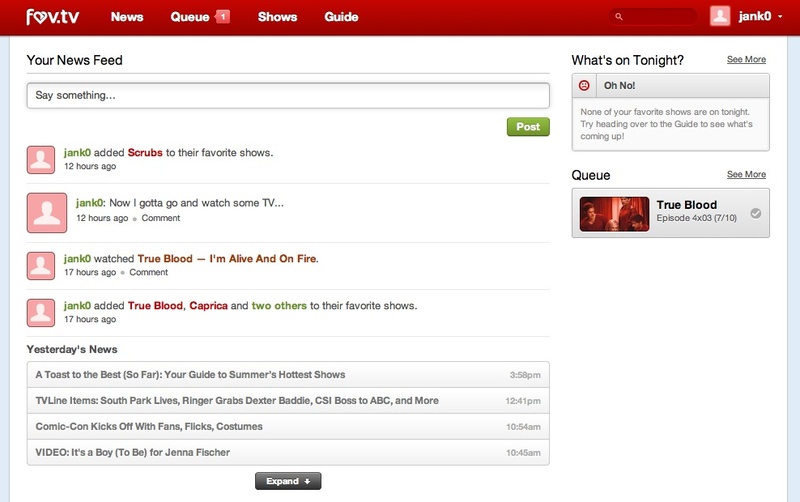 The site allows users to follow their favorite shows and then get notified whenever a new episode is airing. Fav.tv also aggregates news about TV shows and allows users to connect with each other. The site’s co-founder Saverio Mondelli called it a “TV Guide 2.0” when I talked to him on the phone this week. Fav.tv is entering an increasingly crowded market of social video aggregators, TV link sites and check-in services, and some of its current functionality makes it look a little bit like a mix of a TV directory like Sidereel and a more social site like Miso. However, the site is decidedly simple and uncluttered, and Mondelli told me that it has a different take on social than the existing check-in services. “Fav.tv doesn’t care about what you are doing when you are watching a show,” he told me. Users aren’t encouraged to check in to a show while its on TV, but can instead mark off all the episodes they have watched already. The site also offers a more traditional TV guide grid to find content, and users can get an iCalendar feed of their shows subscriptions, making it possible to get alerts in iCal or Google Calendar whenever a new episode airs. Fav.tv doesn’t actually serve up links to episodes hosted on the web yet, but Mondelli said that this feature will be added in time for the official launch in September. At that time, Fav.tv also wants to have an iPhone (s AAPL) and Android (s GOOG) app ready, with an iPad app following soon after. One of the other interesting aspects about Fav.tv is that Mondelli wasn’t ready to commit to any particular revenue model yet, so chances are you won’t have to deal with tons of banner ads on the site any time soon. One idea he mentioned was to work with cable networks and help them to gather intelligence about TV viewing habits that go far beyong simple ratings. “We envision a world where a TV network can get perfect information about a show they’re producing,” he said. Mondelli told me that he and his co-founder Shaun Harrison have been working on Fav.tv for about a year. Right now, a total of four people are working on the site, but the plan is to double the team size in the next two months. Fav.tv is bootstrapped, but in the process of seeking angel funding. Fav.tv is launching in closed beta, but we secured 100 invites for GigaOM readers. Want to check it out? Simply follow this link.